On April 5, 23-year-old Aglaya Tarasova informed her fans that she and Milos Bikovich decided to no longer continue as a couple. The young actress thanked the fans who supported them all this time. Aglaya Tarasova and Milos Bikovich met during the filming of the film "Ice" in 2016. Almost immediately after the first meeting, the actors began having an affair, which they for some time hid from the press and fans. In early 2017, the lovers began to appear together, and in the autumn of last year graced the cover of the magazine and gave interview about their relationship. There were rumors that Aglaya and Milos were going to get married. 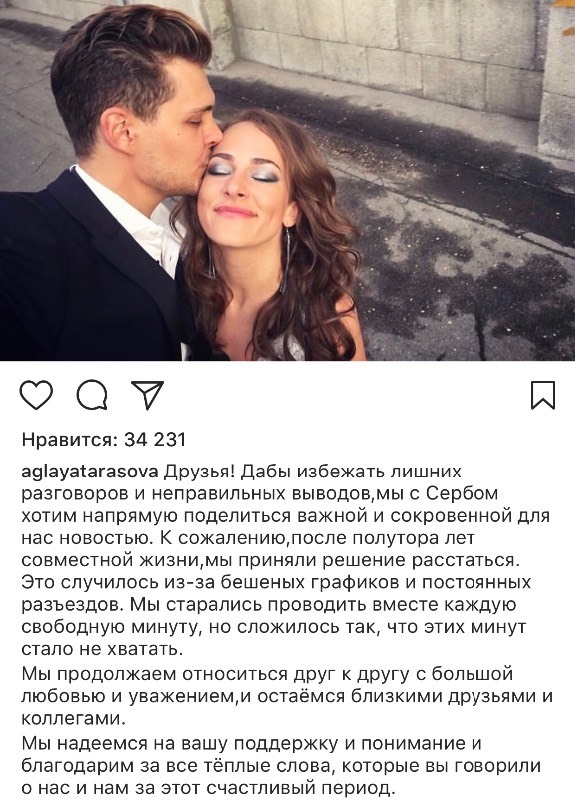 However, today Tarasova said that she and Bikovich are no longer together. "Unfortunately, after one and a half years of living together, we decided to part ways", - the actress wrote on Instagram. Since the beginning their relationships have been accused of being about something other than true love. Critics believe thet celebrities ended up in fake relationships for one reason: the promotion of the film "Ice" is over, the contract has been worked out and it's possible to write beautifully about the parting ways on Insta. Aglaya explained: "It happened because of the hectic schedules and constant traveling. We tried to spend together every free minute, but it turned out that these minutes were not enough. " Tarasova also stressed that she and Milos will remain close friends.